Interop has been a staple amidst the trade show schedule for me for as far back as I can remember. At least, as far back as I can remember doing trade shows. There were some formative years on the NES after school during which I wasn't so Interop-aware. I've probably been six or seven times now, but this year was my first time attending as part of the ExtraHop army. It was an interesting mix of the new and the palpably familiar. The role of the familiar played by visions of Interops past, weaving my way through the slots or waiting in that (ridiculously long) Starbucks line before finding the "secret" one all the cool kids used. The sounds and smells of the Mandalay Bay, at times uncomfortably familiar, coercing to the surface memories of walking those halls many years prior. The part of the new, of course, was played to great effect by my ExtraHop compatriots and the demos I was slinging at this year's event. As it was my first time giving live demos for ExtraHop I found myself ever so slightly nervous during the moments leading up to the opening of the show. Would the laptop hold out? Would the demo go as planned? Would there be questions that would stump me? After all, I didn't have 10 years of experience with this tech to lean on. As it turns out, all concern was for naught. The show was a wickedly good time, I had tons of fun preaching the good word about wire data, and couldn't have asked for a better squad with which to man the front lines. There were so many good moments and memories, from geek to gambling to making true believers out of would be haters that I couldn't possibly meander my way through all of them. At least not without more time than you'd likely care to spend here (and a couple of drams). I will, however, regale you with my favorite handful of moments from this year's show. 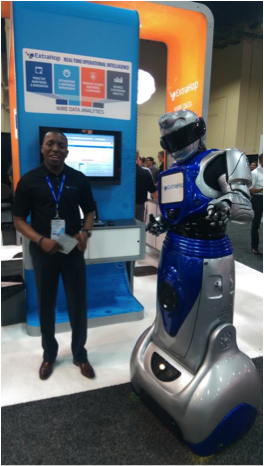 Let's check out my favorite moments from this year's Interop. If you haven't yet met ExtraBot, you are missing out. He is a sentient, technologically advanced mechanical being sent back from the future to enlighten the doubtful and uninitiated about the beauty of Wire Data. I mean, it's either that, or he's a guy on a segway in a pretty top-notch custom robot suit. One of the two. Regardless, he was a blast to have at the booth. The crowd loved him, he had the act down cold, complete with audio and video cues, working the audience, and driving traffic. It's nice to have a fun gimmick during beer hour at the show, but when that results in cranking out a half dozen extra demos because he's handing people off to you once he gets them curious, it's even better. ExtraHop's out of this world event management team (consisting of precisely one person) put together one of the best happy hour meet and greet type events I've attended at a show. Ever. From either side of the fence. The Minus 5 ice bar is exactly what it sounds like. Everything is made out of ice. The walls, the bar, the seats, the decorations - even the cups you drink out of are pure ice. This event not only brought new meaning to "on the rocks" for my bourbon, but it was a hell of a good time. Attendance was off the charts and there were so many good conversations I lost track. What I do remember is that customers were rubbing elbows and talking excitedly with not only ExtraHop folk, but each other as well. That, to me, is as good as it gets. One thing's for sure, though - we totally took that ice sculpture. Just sayin'. 3. You make some of my favorite games, and think you might want to be a customer? #Geeksquee! Okay, judge if you will, but let's be honest here, almost all of us have a little bit of a fanboy/girl/person in them for the right thing. A few of mine are obvious, and one of them is video games. When a mover and shaker from one of the more prominent of those companies, one that had a not so insignificant hand in shaping the way the hours of my youth were wiled away, showed up for a demo, I was excited. When it turned out I got to be the one to give said demo, I was stoked. When they spent 30 minutes chatting with me, and left saying things like "Here's my card, make sure you call us, we could really use this, wah wah wah wah, wah wah wah". I'm pretty sure there was something else there in place of the "wah wah…" in real life, but I effectively lost consciousness and blacked out about that point. My inner monologue was something like "OH MY GOD! YOU'RE FROM <amazing company>! I LOVE YOU GUYS! YOU ROCK!" while he was talking about details for setting up an appointment. Good thing there were other folks there to get his details. Unabashedly, there was more than a little geek squee in that moment, and I loved it. Ours was better than yours. Why? Not because it was bigger (it wasn't), or fancier (though the moths were rather an elegant touch), or more expensive (last one available, perhaps?) but you know what? We were in it. We rocked the hell out of it. We had a great time. Jesse, one of our esteemed leaders and co-founder, set aside some time for the ExtraHop folk in attendance to unwind, shoot the breeze, and bond. I'll tell you what, I know the people I was at the show with better after 3 days together than I do some folks I worked with for years elsewhere. It was a good time. Then there were some drinks. And then it was a great time. Then there were some drinks. And then it was time to get out of there before the fourth rendition of "When a man loves a woman" or some such madness. It was a blast, though, and the people I get to work with rock. 1. Yes, there is actually a time-stamp there. We can read it, and we're not lying. Honest. For me, though, one of the absolute coolest moments of the entire trip (that I can talk about) was getting to convert non believers. This happened more than once, but one time in particular was extremely memorable. There was a sharp, well educated, savvy tech dude that swung by the booth. He was never mean or rude, but he was pretty adamant that we couldn't do what I was claiming we could in my demo. He and I went rounds, technically speaking, for about 30 minutes, digging deeper and deeper into the meat of things. He even evoked ye ole' OSI model on me. I was, however, loving every minute. After over half an hour I am happy to report that we got there. He got it. The light bulb went on, and he left saying "Wow, that's actually some really cool stuff. We might need to look into that". Ahhhh, music to my ears. To a geeky evangelist type there really are few things better in business than taking a non believer and turning them into a supporter and, perhaps with enough care and feeding and education, perhaps some day even a zealot. 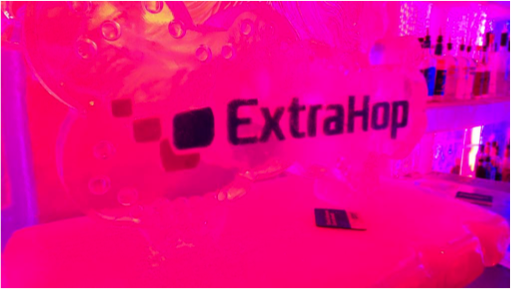 I said it in Vegas and I'll say it here: ExtraHop's tech stands up to anything out there. Grab the (free) demo. Try it. Ask questions and learn. Chances are, you'll end up loving it too. I did. So after a few dozen fantastic demos, more than a few drinks, and some awesome time among like-minded peers, I winged my way home to Seattle. I'm glad to be here and catch up with the fam and the veritable Everest of email that was waiting for me, but I'm still fondly remembering the killer moments that Interop had to offer.